According to the World Steel Association, German steel production increased 3.5% year-on-year in 2017, to 43.6 million tons. Steel production grew again between January and August 2018, by 3% year-on-year. German steel demand is expected to grow only slightly in 2018, by 0.5%, and to level off in 2019. German steel producers have benefitted from price increases in 2017 and H1 of 2018, leading to better results and improved margins. The general economic upturn and an investment rebound in the oil and gas sector have led to an improved order situation, especially for the pipes and tubes segment. 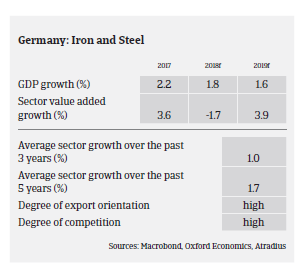 The general equity and liquidity of steel businesses in Germany are better than the manufacturing industry average, except for small wholesalers without pre-fabrication and/or steel service activities. 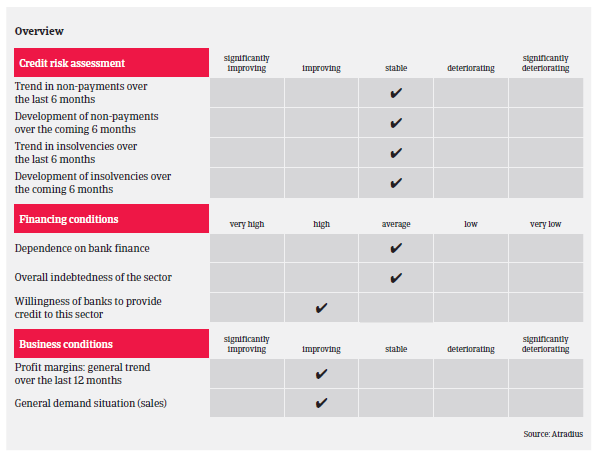 Banks are generally willing to provide loans to the steel and metals sector. So far, the immediate impact of US import tariffs on steel and aluminium is considered to be low (the US accounts for just 1.5 % of German steel/aluminium exports). However, the risk of declining steel prices as a result of additional steel inflow into the EU remains, despite the current safeguarding measures. It is expected that both prices and margins will remain stable at best. Another downside risk is a sharp deceleration of EU economic growth. Besides issues like punitive tariffs and trade barriers there are persistent structural challenges, such as volatile commodity and sales prices and overcapacities, while the number of overseas competitors from Africa, Asia and South America climbing up the value chain has increased, putting additional pressure on prices and margins. At the same time, the EU emission trading scheme and high energy costs in Germany threaten to increase the financial burden for German steel and metals businesses. Transport costs are sharply increasing due to a current truck driver shortage, and the situation is expected to worsen in the coming years. In the medium- and long-term, decreasing demand for steel and metals from the automotive sector, as a key buyer industry (due to a shift to electric engines and lighter car bodies), could severely affect the sector. We have seen no changes in the payment behaviour of companies in the steel and metals sector over the past couple of months, with payments taking, on average, between 30 and 45 days. The level of German steel and metal business failures has remained low, and no major change is expected in 2018 or 2019. 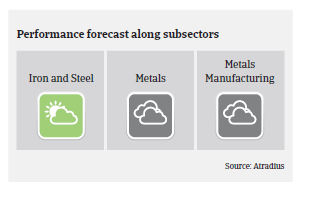 Our underwriting stance is mainly positive or neutral for German steel and metal businesses. While we are generally open for the iron and steel producer segment, we are neutral on metals, as smaller and medium-sized wholesalers in this segment often show low equity and tight margins. The same accounts for metal manufacturing, especially businesses that supply the automotive industry. In this segment companies often have difficulties in passing on higher raw material prices to OEMs. At the same time current problems in the automotive sector like Dieselgate and Worldwide harmonized Light vehicles Test Procedure (WLTP) could impact the profitability/liquidity of suppliers. We continue to be more cautious when underwriting small steel traders, especially those without additional business like prefabrication and weak equity ratios, as they often face strong competition and low margins. We pay particular attention to recent financial information (balance sheets, interim figures, bank status, payment terms, duration of contract, order volume, payment behaviour). 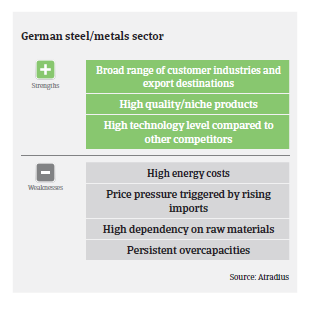 Due to the challenges mentioned above major strains cannot be ruled out for German steel and metals producers in the medium-term – with sales and profit decreases for many businesses along the value chain, coupled with a surge in payment defaults and business failures.